AptoVision’s award-winning BlueRiver™ platform is designed from the ground up to efficiently and cost-effectively address all of the requirements of the professional AV market. 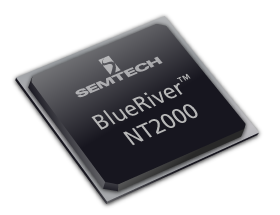 The full-featured BlueRiver NT2000 includes BlueRiver AV Processor for in-line pixel processing. Multiviewers, scalers and video-walls: BlueRiver AV Processor delivers all this functionality at every endpoint eliminating the need for complex and costly external hardware. AVBRNT+FITRX01-SD Semtech AptoVision BlueRiver NT2000 for Fiber & Cat-x Support. FPGA not included. AVBRNT+CUTRX01-SD Semtech AptoVision BlueRiver NT2000 for Cat-x support. FPGA not included.